Today started the part of my vacation where I’m not at work, but everybody else is. It’s all well and good for the weekend to kick off your vacation, but it’s still the weekend, and it is for everybody. Today is Monday. I’m not at work. I’ve only received one work-related phone call. Someone might be coming to buy the Jeep. Jeff hit something like a brick with his wheel and I drove him around getting prices on a new or refurbished one. Not only did we find one that is $400 less than the dealership wanted, we also got cart food, which was crazy delicious. Dill tuna salad with country cole slaw, pesto penne pasta with parmesan (say that five times fast), a hunk of cheese and a hunk of french bread. Yum! The dude who might be buying the Jeep should be here any minute, and that will be a load off. Then it’s to the DMV to cancel the tags, and then I might be able to get the house clean ebfore D gets home. Or not. Either way, I cleaned out the stinky litterbox. So everybody’s happier. I’m working on this sample for the guy who has the top ten website. If he likes it and publishes it, I will ask if I can link to it here. Come to think of it, I think I mentioned that yesterday. Geez, I’m turning into my grandma. 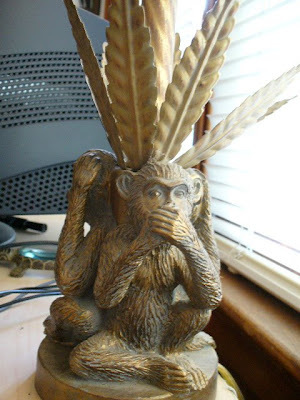 More to follow…for now here is a picture of the base of my monkey lamp.